Ratliff (L), Shaw. Click to enlarge. 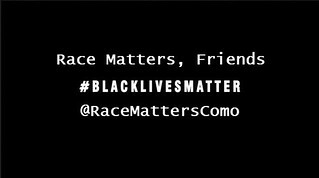 "Being uncomfortable is a way of life"
COLUMBIA, Mo 2/9/18 (Beat Byte) -- A schism between two Columbia-based racial justice groups has become painfully apparent in the wake of city manager Mike Matthes' diversity breakfast presentation. Matthes' stereotype-driven comparison of young black people dressed for work and play not only divided public opinion, but also the Columbia NAACP and Race Matters, Friends (RMF). 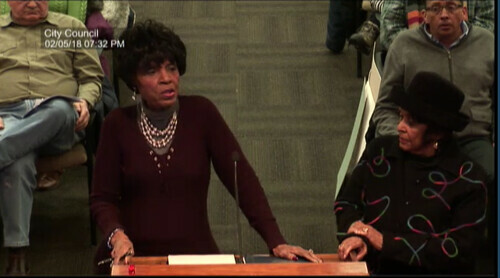 About a Sunday Columbia Missourian story, "there was criticism from some of our citizens here...about what the NAACP does or does not do," longtime Columbia NAACP president Mary Ratliff told the City Council at its Monday night meeting. "We are one hundred and nine years old, and we figure that what we've done and what we do in Columbia speaks for itself, so I will not dignify it [the criticism]." The Missourian piece featured harsh criticism from Race Matters, Friends president Traci Wilson-Kleekamp, who joined Missouri NAACP president Rod Chapel accusing Ratliff and her group of inactivity, if not apathy. Ratliff called the allegations "unfounded and disgraceful." Unfounded or not, a new Columbia NAACP chapter is in the works, Wilson-Kleekamp posted on Facebook Tuesday. "Ratliff (thankfully) does not represent the Black community and we should put that notion to rest finally and for good by instead organizing a 2nd chapter that is strategic, critical and collaborative," she explained. "That effort is already underway." Opinion over the Matthes presentation has fallen along similar lines, with RMF firmly condemning and Columbia NAACP just as firmly supporting. Matthes used the same or similar pictures in his presentation Ratliff encountered at an FBI-led racial bias training course, she told the Council. "The pictures offended many people, but they didn't offend me because I know that they're used in training," Ratliff explained. "We thought the city manager did a most courageous thing. We applaud Mr. Matthes on his keen understanding of what it will take to make Columbia the model city all citizens envision." Ratliff's presentation followed RMF members Suzanne Bagby and Sarah Senff, who called on the Council to replace the city manager. Their charged and emotional presentations depicted Matthes as a vector of racism, whose "toxic" views of the black community are open to potentially violent interpretation by law enforcement and other city personnel. Ratliff also addressed those challenges. "My NAACP group supports the speech that you gave," she told Matthes. "The only way we can resolve racism is to talk about it. That's what we're doing and we're not going to let anyone derail us." Fellow Columbia NAACP member Valerie Shaw concurred. "It takes courage, and Mr. Matthes showed that courage, to have difficult conversations about uncomfortable things," she told the City Council. "As a black citizen, being uncomfortable is a way of life."